Thanks, folks. I got the engine back together today and was able to test it. Unfortunately, the results are mixed. It still runs great in the original, forward direction, no change there. But when I switch it to reverse, it doesn't run nearly as well and the engine valve (not the reversing valve) leaks a lot of air out the valve linkage side. This is also the side where high pressure air is admitted in the reverse setting. So, either the fit is a bit loose on that side or air is being blocked somewhere in the reverse setting. I've disassembled the engine to begin troubleshooting. I'm going to add an o-ring to the engine valve where it seems to be leaking. I'm also going to extend the two slots that connect to the leaking side to be sure the air has a clear path to the cylinder. I had a devil of a time trying to get a grip on the rotary valve with needle nose pliers when trying to adjust the timing, so I cut a slot on the end of the valve so I can turn it with a screwdriver. Hoping for better results after I make these changes. Just caught up here Chuck. That's a nice rendition of the reversing valve and as George says 'sits' in with the rest of the engine just fine . I'm sure you'll get that leak sorted out. I added some width to some of the port interfaces to reduce the chance of blockage. I also fitted a 3/8 x 1/4 x 1/16 o-ring on the end nearest the linkage. The performance improvement in reverse is negligible and I'm still getting a lot of leakage out of the linkage end. I suspect the real problem with the o-ring I used is that it's not soft enough to deform from the relatively low pressure. But, I don't have anything softer so I'm going to replace the standard o-ring with a quad-ring that I do have on hand. It's a bit thicker in cross section and will fit tighter and hopefully the shape will improve the seal. I'm also going to cut the shoulder on the linkage end back a bit so I can fit the the linkage arm a bit tighter against the valve block. If none of that results in substantial improvement, I may resort to remaking the dreaded rotary valve piece... Or I may try finding a silicone or other type of o-ring that is softer. The size of the newer reversing valve is perfect Chuck. As George said, it looks like is was designed as part of the engine. Thanks Bill. I'm really happy about everything on the engine except the performance in reverse. Major air leak and very slow running. Forward direction is perfect. I had a small leak around the outside edges of the reversing valve. But I cut a shallow depression on the inside face around the screw hole so only the area containing the groves would contact the transfer holes. That fixed the air leak there. i think the problem now is in the rotary valve. I squirted a some oil into the inlet pipe then turned the air on with the the valve reversed. A lot of oil came out of the rotary valve on the linkage side. I'm going to spend the day troubleshooting and trying to get to the bottom of it. Is there any spring tension on it Chuck? I am not sure which way you move the handle for reverse, but could it be loosening the screw some? Maybe something as simple as a spring (wavey) washer could help. I am sure you will get to the bottom of it. Just thinking out loud here. You might be on to something, Bill. I'm thinking a bellville washer that exerts pressure directly over the grooves might fix he problem. Have to see what I can rig up, since I'm pretty sure I don't have a spring washer in the right size. I love wave washers. But anything springy or squishy will work. Got any thin shim you can bend? I tried making a dished washer out of 12L14 round stock. It applied pressure to the slotted disk only on the grooves. It stop the leak on one side but introduced a leak on the other side. I have no idea why. So, next I decided to install an o-ring between the valve members. It would have worked, except the o-ring slot depth cut into the port connecting holes drilled in the back part... sigh. So, tomorrow I will remake the reversing valve body and drill the connecting holes further back in the part so the o-ring groove won't cut into them. There will actually be 2 o-rings, one outside the slots and one inside the slots. I think this is going to work. Edit: I forgot to mention, I may have a problem with air leaking from slot to slot. The o-rings will have to compress flat enough that the metal parts still come in tight contact. Chuck - looking at your pics of the valve (Post 174) you don't have much material to get a seal but do you not have the width on that first land between linkage fixing point and the first groove to place a 1mm section O ring? Given the right dimensional fit that should cure any leak coming from the linkage end. Re the rotary reversing valve - they can be difficult to get a perfect seal but lapping both faces help and ensuring that the central pivot is truly square with the faces is vital. On the last one I made I used an Oring, not just to give a seal on the pivot but also to give the necessary tension on the faces. Never be afraid to offer suggestions or even criticism. I'm more interested in learning than taking offense. I did add a second o-ring to the engine valve, so I have o-rings on both ends now. I've also added a total of 5 o-rings to the engine pivot shaft. On the new reversing valve, I'm adding an o-ring outside the ports and a smaller o-ring between the ports and the center pivot screw. 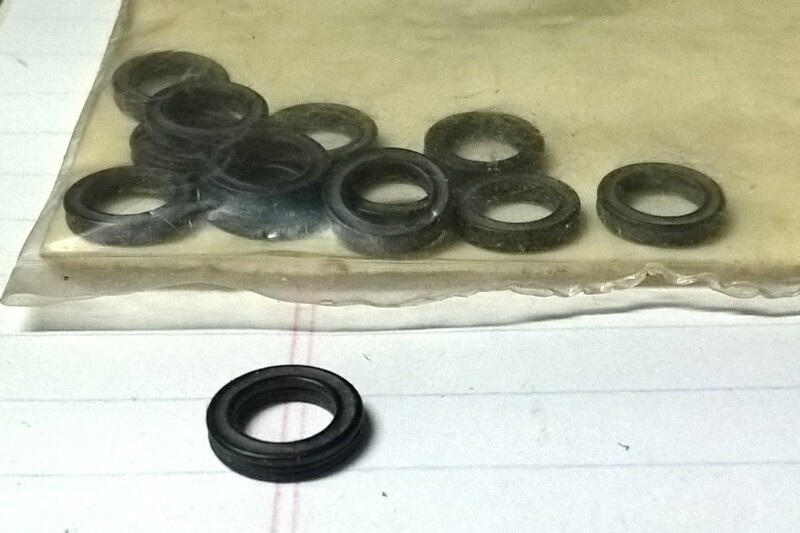 The slot depth for the o-rings will be about .004" shallower and .007" wider than the .0625" thickness of the o-ring. I've used o-rings before, but am far from an expert, it's always kind of a crap shoot whether it will work or not, but in general I've found the shallower, wider approach to work pretty consistently. Well, the new valve body with o-rings is a total failure. I think I need to increase the dimensions of the reversing valve or come up with a new reversing mechanism. Hmmmm, so now we get to watch the really interesting part of this engine!! Hi Chuck - I'm not sure if you are referring to the engine rocking valve or the reversing valve itself. This is the last reversing valve made. You will see I have lapped the brass face and the pivot hole was bored to ensure squareness to that face. The o ring sits in a recess at the back of the valve and provides the seal and the 'spring' to keep the valve faces together. It is purely face to face contact. Without stripping it down I have a feeling I had to remove the lip on the stainless part and lap that too before getting a good seal. It handles 25-30 psi without leaking. I have made three or four of these valves to the same format one of them around 16mm dia. Chuck if it is the reversing valve that is leaking you also want a spring under the screw head to hold the moving part against the main block. Brian had a similar problem on the valve he made for his twin oscillator, worked OK once he added the spring and made sure there was clearance around the screw so the two parts could find their own level rather than being cocked to one side by the screw.